Ugh. I started tearing my house apart on Monday. By Wednesday morning only about 25% of the place was packed up and I was thinking that it would be so much easier if I just put in all in a giant pile in the street and burned it. But I didn’t. I forged ahead, stepping up my game, literally throwing stuff across rooms into boxes, and not paying attention to anything that didn’t lend itself toward packing. No checking my email, no idle chit-chat, no fun. While I crashed around the house packing things up, a pot of worry simmered on my backburner. What if the truck isn’t there when we go to pick it up? What if we can’t get the parking space right outside the building for the truck? What if I’m not done packing by the time the movers come to load up the truck? As Murphy’s law dictates, anything that can go wrong will go wrong. Of course the City of Glendale had to do all kinds of construction on the street where I live during the week that I’d chosen to move. Of course. Before I go on with my story, let’s establish that moving day was Thursday, Feb. 20th. On Feb. 17th, a bunch of construction workers had invaded the area and started tearing up the sidewalk. Jackhammers and rubble everywhere. Worried, we asked one of the workers if they’d be finished with their work by the 20th. We were told that, yes, they’d be finished. 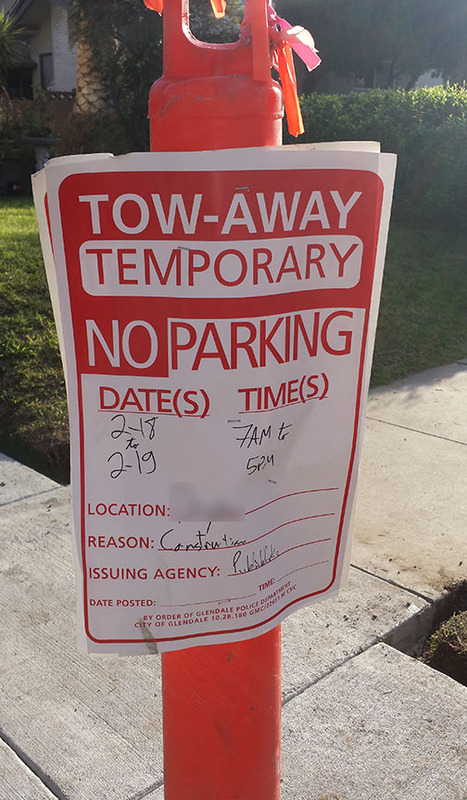 The temporary no parking signs indicated that they should be wrapped up by the end of day Feb. 19th, but I had a nagging feeling that they wouldn’t be done. I’ve worked alongside construction crews before, and nothing is ever finished on time. Another fun tidbit is that street cleaning and garbage pickup happen on Thursday mornings, so there is no parking on my street on Thursdays from 9 am-12 noon. I planned the entire move around this. I scheduled the pickup time for the U-Haul truck at 11 am, so that I would be home around 11:30ish, guaranteeing that I would be able to park the giant U-Haul truck right outside of the condo. I figured I’d park illegally for 30 minutes, and stick around in case any parking enforcement came by. 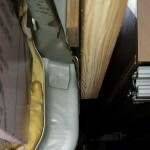 On Feb. 20 at around 10 am someone from U-Haul called and said they didn’t have my truck. Another customer had rented it, and should have returned it but didn’t. Cue Seinfeld moment. 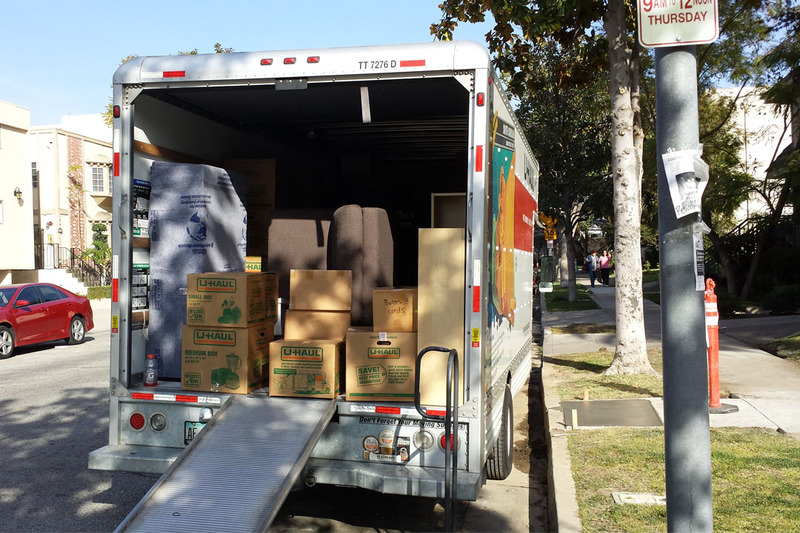 Fortunately, another U-Haul location had a truck that was available, so the U-Haul guy picked it up for us. It worked out fine, but we were a delayed by 20 minutes or so. Pulling up to the condo at around 11:50 am, we were appalled to find that the entire street was filled with cars. What happened to no parking from 9 am-12 noon? Does no one have any respect for the rules anymore? (That was tongue-in-cheek.) Luckily, there happened to be a spot just large enough for a giant 20’ truck in front of the neighboring building. We snagged it. Not ideal, but we could still make it work. 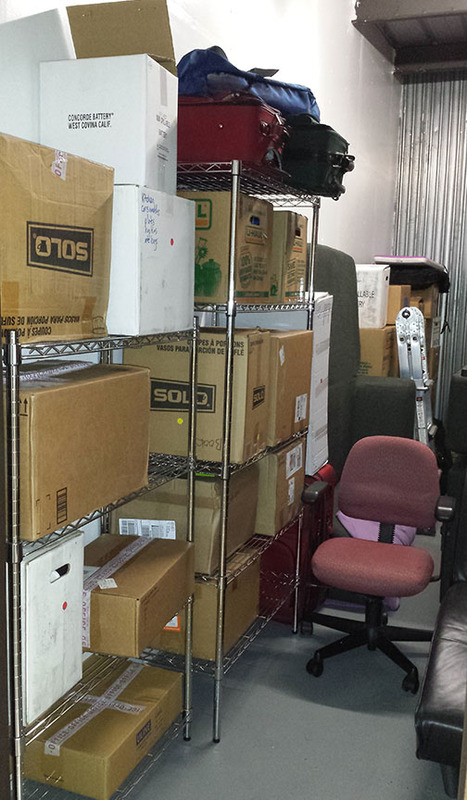 The movers were scheduled to come at 2 pm to load up the truck. I wasn’t done packing. I frantically raced around the house throwing things into boxes. As I packed, I heard someone laying on the horn outside—not unusual for this area. Lots of dirtbags. It went on for at least 10 minutes. Someone was driving up and down the street honking. I peeked outside. Cement truck. I thought about the large hole in the sidewalk right next to the truck. Oh, I get it. They were trying to attract attention so someone would come out and move the U-Haul for them and make way for the cement truck. If you’ll recall, today was the 20th. The sign said no parking from the 17th to the 19th. I made sure to look at the sign as Jef parked the truck. We had every right to park there. We didn’t venture outside to talk to the workers—it didn’t matter what they said, we weren’t moving truck, and we knew they were just going to try to bully us into moving it. We ignored them, stayed inside and let them figure out their next move. Unfortunately, I left the U-Haul dollys right outside my door, so if anyone came nosing around it wasn’t going to be hard to figure out who had rented the U-Haul. And moments later, a worker was knocking on my door. We didn’t answer. He kept knocking. What in the world was I supposed to do? The truck was parked there legally, and I knew it. Not only was this guy banging on my door, yelling, and threatening to tow my vehicle, he had to hop a locked gate to do it (a ridiculously easy to defeat gate, but a locked gate nonetheless). At this point he was trespassing. Several minutes passed. Still banging and yelling. I called the non-emergency line, of course, and asked to speak to the traffic people. After explaining the situation, I was told that I had every right to park there. They were going to dispatch someone to get construction worker fartface bully to go away, but he eventually left on his own sometime during the phone call. They said to call back if the guy refused to leave or threatened to harm us in any way. 2:00 pm rolled around and two guys showed up to load up the U-Haul. Not five minutes after they began loading up the truck, Fartface started screaming at one of the movers to move the truck. Seriously, screaming. Like a two-year-old having a tantrum. I could hear him loud and clear from 100 feet away, indoors. Then he came stomping up to my front door and started yelling at me to move the truck. Jef swiftly shielded me from Fartface and calmly but fimly told him that the sign did not say that there was no parking on the 20th, and we would not move the truck unless a police officer told us to do so. We informed him that we already called the police and they assured us that we had every right to park there. Fartface continued yelling as he stormed off, saying that he was going to get his inspector and that they were going to tow the truck. I looked outside a few minutes later, and the Fartface was on his hands and knees, smoothing over the freshly poured concrete with a trowel. He was obviously able to get his work done even with the truck in the way. Exactly what was all that fuss about? And what would he have done if it was a regular car that couldn’t be traced to an owner? Pound on every door on the street? Anyway, it was hot out. We were all sweating. From a distance, Fartface looked like a sad little worker bee. He kept his head down, and worked diligently. He probably had an incompetent boss who was supposed to get a permit that covered the 20th but never did. His boss probably treated the workers like crap, and mismanaged the project in countless ways. I brought him a cup of water. “This is for you,” I said, “I’m sorry for the inconvenience.” The look of surprise on Fartface’s face told me that it was the last thing in the world that he expected. He probably thought I spit in it or something, but I didn’t. (I would’ve given him something packaged, but I didn’t have anything.) It’s always better to try to smooth things over, even in a small way, than to let everyone walk away angry. The inspector never showed up. Neither did the tow truck. The rest of the loading day went off without a hitch, Jef and I drove up to Pinole yesterday, and today we (mostly Jef) spent the afternoon unloading everything into a large storage unit. It was pleasantly uneventful.